We asked Sven, why do you volunteer with the Museum? Here is his story in his words. Sven was born in Örebro, Sweden 1945. After High School Exam 1962 he got a job at the administrative offices of the Swedish State Railway's Main Restoration Shops in his hometown. 1967 he was accepted to the 2 year railway officer education at the Railroad school in Stockholm. After excam from there 1969 he was stationed in Uppsala as one of five officers in charge of Uppsala Central station and a number of sub-stations reporting to Uppsala. While living in Uppsala, Sven met an exchange student at the University there, Chris. She had gown up in the Bronx, NY, but her parents were swedish speaking, so she was bi-lingual and more. They were married 1974. As they had no children, and with Sven's railroadpasses, they travelled extensivley throughout Europe and North America. Sven had now been promoted to a position at the Railway Headquarters in Stockholm. He and Chris still lived in Uppsala, where Chris had gotten a secretarial position for one of the professors at the Agricultural University, Ulltuna. Sven commuted by train to Stockholm. A few years earlier, Chris mother had become a widow and moved to her old homestead outside Vasa in Finland. 1976 Sven applied for and was promoted to a transportation sales position with location in Umeå, just 4 hours ferry voyage across the Gulf of Bothnia to Vasa. In the new position Sven was responsible for setting up freight contracts for paper mills, lumber mills and other industry in Northern Sweden. He and Chris travelled frequently over to Finland and helped Chris' mother on her small farmstead. Every summer Sven and Chris visited Chris' friends and relatives in USA. 1983 they finally made the decission to emigrate to the US. Before Chris came to Uppsala she had spent 4 years at Oral Roberts University in Tulsa, OK and still had friends and contacts there. Thus that's where they moved. However, Sven could not stand the heat and humidity and lack of winter there, so he gave Chris two choices, Sweden or Minnesota. And Minnesota it was. Sven got a job at Dayton's Department Stores transportation department, and Chris a position at Billy Grahams School of Christian Writing. Chris also became regional editor for the weekly Swedish American paper, Nordstjernan Svea, through which position both Chris and Sven became deeply involved in Swedish America. Sven transferred over to Target Headquarter, where he stayed mainly in logistic functions until retirement 2010. Sven and Chris were never blessed with any kids, but opened their home for cats and dogs. In 2015 Chris health began to deterioate. They also lost their house in Hudson, WI to forclosure and moved to an apartment in Chaska. Apartment living was hard on them, as they were used to freedom, gardens and unlimited pets around. They tried different apartments, and finally found one at Waterford Manor, a 55+ complex in Brooklyn Park that suited them. However in less than six months there Chris died, after a very rich and interesting life. Sven and Chris had not any close friends and Sven became very loonley and depressed. His doctor ordered him to find something meaningful to fill his time with, and suggested that he should volunteer at a hospital. But Sven thought "Once a railroader, always a railroader" and through intense googling on internet he found Minnesota Transportation Museum in St Paul, where he was accepted as a Docent. That litterary saved his life. He almost imediately got close friends there in an environment that he loved. 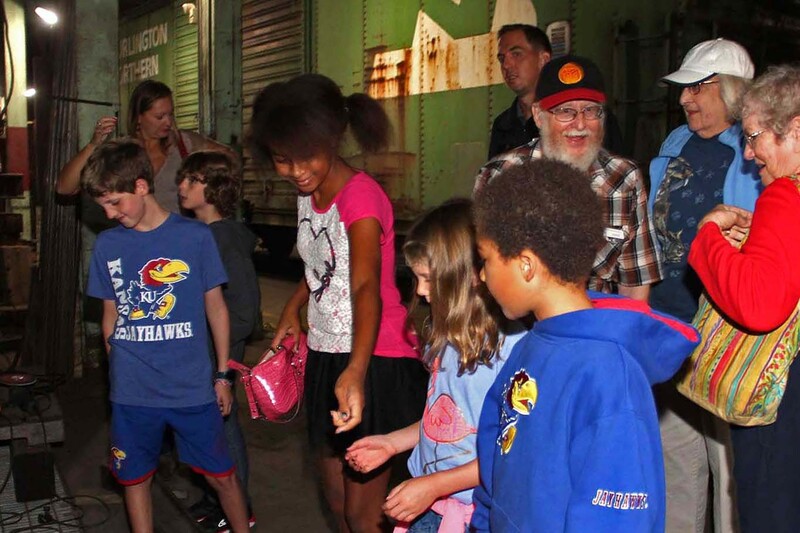 Also meeting and guiding the visitors of all ages has given him a good feeling of being able to share his interest in railroads, and railroad equipment. He hopes to be able to hang around at MTM, especially Jackson Street Roundhouse, for many years to come.